It just a lot easier for consumers selling second-hand goods to accept popular cryptocurrencies as payment for their wares. 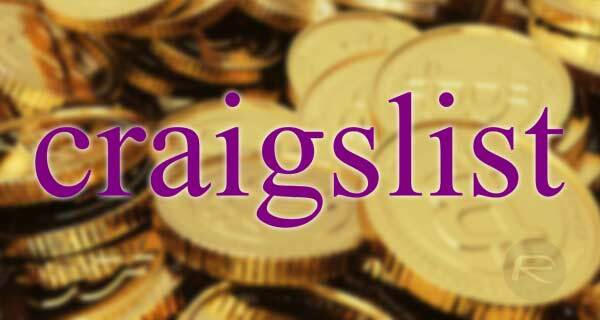 Craigslist is embracing the current cryptocurrency spike by adding a new button to its website that allows individual account holders selling items to specify that they will accept payment in the form a decentralized digital currency, such as Bitcoin. There are plenty of websites and marketplaces online which offer the same service as Craigslist. However, that particular site has proven so popular due to the sheer volume of users that it has, the depth of choice and categorization of products that can be sold, and the fact that it remains an entirely minimal proposition meaning the owners haven’t bloated the site to make it look pretty or appeal to the modern world. Also, unlike sites such as eBay, Craigslist doesn’t actually handle or allow any financial transaction to take place on its servers, which means that the addition of cryptocurrency as an option is more for informational purposes to the seller to form part of the sale negotiations. Users with experience of the changes are suggesting that the new option can be found when sellers are going through the process of creating a new listing. The new feature, which is a simple checkbox, is located in the “posting details” section, and simply mean that a seller is letting a buyer know that they are willing to exchange their item for a currency such as Bitcoin, Litecoin, or Ethereum. The financial transaction and all negotiation, including the transfer of the cryptocurrency, is handled outside of Craigslist’s domain. This isn’t a huge change for Craigslist overall but it is representative of the current importance that is being placed on cryptocurrencies like Bitcoin, which, incidentally, is currently going through an exponential rise in value. It could also be a much easier option for people looking to buy and sell on Craigslist who have previously struggled to find a payment method that is trustworthy and which suits both parties involved in the deal. Cash is generally king on sites like these but where high-value sales are involved, support for Bitcoin makes total sense.